What are you doing most of the day? Sitting? Well, join the club! The majority of jobs include long sitting periods throughout the day. It’s unbelievable, but we sit 30 hours a week at average because oftentimes people only move to the lunch room and back for several reasons. Either too much to do, stress, no time, or slowly starting inertia (inactivity). Muscle degeneration — poor posture will cause tightness in hips and your “feel good” Psoas muscle (read more about it in my post HERE), as well as kiss your abs goodbye! How often do you get up during the day? 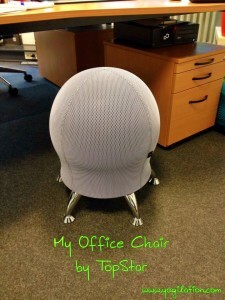 Do you have a special chair at your workplace? Perhaps a big ball? Or how about a height-adjustable desk that allows you to stand up while working? Set your alarm clock every hour and get up to walk to the printer/kitchen or to talk to your colleagues instead of writing them an email. Stay hydrated! Always have a big glass of water (or unsweetened tea) next to you to keep your blood flow going and organs working. Get a height adjustable desk. I used to have one at my internship with a big bank in Chicago and LOVED IT! I am currently looking into buying one for myself for my office. It’s amazing because you are automatically more active the whole day. You standing up increases the likelihood to go to the copy room, your co-workers, and other places you’d probably avoid getting up for if you don’t really have to. Believe me, it will make you more energized, motivated to work, get things done, AND even to go to the gym after work! It just keeps you going and more balanced and happy as a result! Use a Pilates pillow/cushion. You can use it on your office chair or when you stand up. (Find a picture of it and exercises for it HERE). It’s very versatile and will work every muscle in your body. This will not only improve your blood flow and cardiovascular health, it will also increase your concentration and productivity at work.